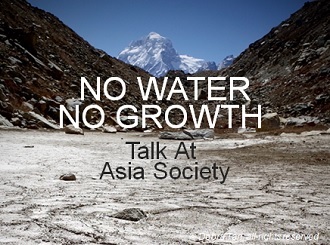 Asia has limited water resources, yet water is the only resource we cannot live without. Two of the world’s most most populous countries — India & China — are water stressed, and rampant water pollution & population growth has only further exacerbated this. Rivers are important to Asia. The Amu Darya, Brahmaputra, Ganges, Indus, Irrawaddy, Mekong, Salween, Tarim, Yangtze and Yellow are the continent’s cradles of civilization. Yet, climate change, evident in their common source region, the Hindu Kush Himalayas (also known as the Third Pole), threatens their upper watershed. One in every 2.5 Asians lives along these rivers and trillions of dollars are exposed but there is little conversation on this. Does Asia have enough water to develop if “business as usual” continues? Join the head of China Water Risk for key findings from their new report and a frank dialogue with some of the world’s top water management and policy experts, as well as mountain explorers and development experts (for more on the experts see here). We hope you can join us for this unique & meaningful dialogue. Register now to attend the event (click here). Tickets are on a first come first serve basis.